A critique of national parks as "America's best idea"
Anyone who has been watching the epic Ken Burns six-part documentary on PBS entitled The National Parks: America's Best Idea cannot help but be swept up by the places captured by his camera. When I see Yosemite or the Grand Canyon, I want to drop everything and plan my next adventure, discovering new places I have never seen. 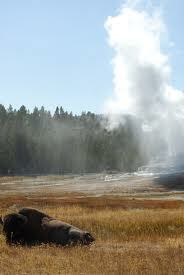 When I see familiar video and old pictures from my beloved Yellowstone, a flood of pleasant memories overwhelms me. For evoking such responses in a well-traveled man like me, for doing so to a large number of people for whom the national parks is but a sketchy mystery, Ken Burns should be applauded for that alone. Ken Burns does many things well both at the sweeping level as well as in minute points (for instance, one I quickly noticed was in not sharing the discredited story that the national park idea was dreamed up at Madison Junction in Yellowstone back in 1870). What I'm writing from hereafter shall be critical, but I don't want to take more away than I will in the following paragraphs. By all means, if you've never visited a national park, if you want a basic primer on the history, if you want to see beautiful things and be inspired, please take the time to watch this documentary. I can't imagine watching it and not wanting to visit some of these places, not wanting to know them more, and not having a greater sense of many of the complicated issues that surround the parks. It is worth at least some of your time. My biggest problem with The National Parks: America's Best Idea, filmed by Burns but written by Dayton Duncan, is that we are left with a generally positive view of American history. Whether we are talking about the "national park" idea itself, the process by which national parks were "saved," or many of the characters involved - coming to mind right now are Teddy Roosevelt and John D. Rockefeller Jr. - I am afraid to say that I believe that the story is far bleaker. That we can be inspired still by these lands is less a testament to the so called "national park idea" so much as the accidental force of American history that allows them to be temporarily saved while everything else is ripped to shreds. Let's start with what it is to say that the national parks are America's best idea (although that view was qualified by one historian who suggested it was the second best idea). What does that really say if that's true about our country? It says to me that in a country that basically destroyed an entire continent, it found fit to preserve only the most spectacular landscapes and wildlife refuges it could find (and even then, only barely and not entirely). The "best idea" is that we didn't absolutely destroy every last inch of the place; we had destroyed Niagara Falls, cut down the eastern woodlands, turned the Great Plains into a dustbowl, forced native peoples to the point of extinction, killed almost every last buffalo, and nearly poisoned every stream looking for ore before then damming them. We poisoned the air, but we managed to save these last refuges by keeping them within the public domain. Wow, good on us! And, that says nothing about slavery, sexism, economic classism, and on and on. Yet, when we "saved" some lands as national parks, Burns would have us believe that this a "movement" of preservationists, some enlightened people in government, and the fortuitous involvement of the railroads. A movement? In what sense? As noted in the documentary, the first mention of a "national park" was by the artist George Catlin, who wanted to close off the west so that native tribes could live as they had always lived. Yosemite was set aside as a state park as an obscure bill during the Civil War, on the pretense that the land was useless. The first national park, Yellowstone, was made a national park in large part because the Northern Pacific Railroad believed it could best profit off the park if it only had to deal with the government. Other parks were set aside often by the efforts of wealthy elites. John Muir is a nice voice to quote, inspiring many ultimately to see the national parks as a movement, but the truth is that parks were not set aside because there was a cogent "national park" idea, not because there was a strong impulse to protect the areas from capitalistic exploitation, not set aside because of the force of a movement, but they were set aside by the very same capitalistic, exploitative forces that were at the same time destroying everything else. When Jay Cooke financed the Northern Pacific Railroad, at least until he went broke after in part causing the Panic of 1873, he understood that the railroad would be most profitable not by simply supporting extractive industries but also by promoting ridership, by promoting the places along the line that would be attractive. Yellowstone, i.e., Wonderland, was that place, and it was easiest to exploit in the hands of a single owner –in this case, the U.S. government - not in competing with local businesspeople who were already trying to set up shop before Yellowstone became a park (and even as it was being "discovered.") Burns, for his part, makes note of what the railroads were doing in the parks, but he fails to make as much of it as I think is necessary to understand the story. My point is this: The railroads - the greatest forces of capitalism and destruction in the West - are both the destroyers and the saviors of wild lands. That is, it was not some interest against the grain of destruction that saved the national parks; it was the very same force that did both at the same time. Another example of the destroyer being the savior was Gen. Phil Sheridan, often credited with having a large part of saving Yellowstone's bison herds and for pushing for the military rule that "saved Yellowstone." Sheridan had just finished destroying the buffalo herds he was about to save. The great slaughter of the 1870s of bison was policy of the U.S. government and of the military, and especially Sheridan and Gen. Sherman in particular. Market hunting on the plains was encouraged in order to starve native tribes and force them into government reservations, thus opening the land for settlement and clearing the way for the expansion of the railroads. It was the same total war strategy that Sheridan and Sherman used to win the Civil War. When the Texas legislature considered passing a law to stop the buffalo slaughter, Sheridan himself showed up to testify against it, saying that the hunters had done more to solve the Indian problem than anyone in the field of battle had ever done. Yet, when the buffalo were about to be destroyed for good, Sheridan shows up in Yellowstone to save them, teaming up with a Senator from Missouri who had supported the Confederacy - George Graham Vest. Why did Sheridan do that? Change of heart? A love of the "national park idea"? No, Sheridan, like most military commanders, believed that the military should control the West, not the Department of the Interior. The buffalo issue was a convenient wedge in the military power play. Yes, Interior was powerless to defend the buffalo, was corrupt in its collusion with the railroad companies, but it was the military that had overseen the policy destroying the herds in the first place. So, the very same force in Phil Sheridan both destroyed and saved the buffalo. We also find a similar story in Teddy Roosevelt, the man so eager to kill animals his entire life worked so hard to protect them from extinction. How can you kill animals if there aren't some left? That passes for enlightenment? Surely, it was a step above those who actually did kill animals all the way to extinction. Yet, Roosevelt's view, like that of Gifford Pinchot (his chief forester) was that wildlife and landscapes and forests and waterways were ultimately there to serve the good of the country. They are ultimately expressions of the nation itself. And, out of this manliness, this patriotism, we get what seems to be the paradox of protection and setting aside and reserving and sometimes even preserving. But, it's the very same force that calls on both. That's how Roosevelt could at once support a dam at Hetch Hetchy and support preserving the Grand Canyon as is; he operated from the very same idea in a way that could lead to multiple, apparently conflicting ends. What I'm getting at is that in the Ken Burns view of history, dynamic people rise up within the American democracy and do dynamic things that have often had profoundly good, if complicated, effects on all of us who live now. These people see the problems and rise against the grain often to do things that are heroic. The national parks, in the view presented by Ken Burns, are that refuge, are that ingenious system blended by John Muir's ecstatic reverence and practical American know-how (think Stephen Mather or Horace Albright as examples) that have managed to use what's best of what's uniquely American to protect what's best so that we can now have these reservoirs (or perhaps, preservoirs) of inspiration as we face our current world dilemmas. John D. Rockefeller, Jr. anyone? Or, is my point clear? Still, even if Burns is right and I am wrong, the original point would still be true. If the national parks are America's best idea, that would be a particularly sad state of affairs to admit about our history. It would be as if John Muir's worries about the impossibility of fighting those who would despoil everything were in fact correct. Surely, it would be a miracle if these lands survived much longer under such an onslaught. In fact, they survive as well as they do because they are outgrowths of the same corrupt, exploitative system and are simply a part of it. It didn't hurt that Mather and Albright really did find a way for millions of people to "see America first" (to borrow the slogan of the Great Northern Railway). Unfortunately, it's not enough that these places have been set aside. Ecosystems are far larger than park boundaries; animals trapped within them ultimately don't help these parks flourish. I'm thinking particularly of the dynamics of wildlife in Yellowstone and the suffering of its northern range, of buffalo not allowed to re-establish habitat, of wolves and grizzly bears. Perhaps, it would be good enough to protect parks simply to let the story of our country play out, but over time, it won't work. You can save the boundary, but you won't save the land (even without another Hetch Hetchy dam). So, the hard truth I'm ultimately driving at is that the force of American history is bound to undermine those things that it has managed to set aside. Even though we can admit that there are some accidental preservation that's bound to happen within even the most ruinous system, it won't work. Nature is not a parcel; it cannot flourish simply by setting aside refuges. That is to say, even at its best, the national park idea is not a particularly good idea. Whether we are talking about people acting against the force of American history or in concert with it, it ultimately cannot be positive simply to set land aside within a political boundary. In the short term, yes, I can and have been inspired to ecstasy like John Muir, drawn into the magic, understood the power of place, and been replenished time and time again. However, for the buffalo that face slaughter or forced movement every year, for native peoples who have lost their connection with wildlife and land essential to their self-identity, the present is already a disaster of sorts. Time will only erode things more, the only hope being that the system that confines beauty within national park boundaries disappears faster than the parks themselves. The hard truth is that we who have been called Americans come to terms with our truth, that we haven't been a particularly good people, at least to our land, at least to people not counted as among our own. Perhaps, this is true the world over - I suspect it is - but in the caste we've been placed by Thomas Jefferson and others, it most certainly is. If we don't come away from the national parks without a profound sense of despair conjoined with our wonder, I don't know if we've really understood what it is to see both the Lower Falls plunge into the Grand Canyon of the Yellowstone and it's multi-colored walls within the same land where buffalo are routinely rounded up and shipped to a slaughterhouse in order to protect the interests of the livestock industry. The very same forces at work in the very same place, and we have every reason to be appropriately inspired and pained. There are no uniquely American forces to join in the quest for preservation, or for encouraging a president with the flick of his pen to do so. That force, if it exists, rests with a fundamental change in the way we look at land and people and the way we've organized both within this nation; it is even to question the nation itself, not just this nation, but any and all that would claim a land as its own to do with as it pleases. As I write, I wonder if I am one with the very same forces of American history or someone set against it. Somehow, I doubt as a single writer that I am a force at all, not until I and that writing am attached to an actual movement. I'd suggest an actual movement, not the one imagined by Burns, actually begin. From within the cauldron of boiling pools under the stars, we imagined we were alone and in love. Then, the man in green and brown approached before nicely kicking us out. "It's for your protection; it's for the good of your park," he informed us. I understood what he was driving at from within his world, but I couldn't help wonder if it might be different if .... And, if more inspired, ecstatic voices wonder along, then maybe ... well, until, that supervolcano goes off, anyhow.